IoT appliance – appliance with ability of connecting to external device directly or through internet. IoT protocol – the way of connecting to internet. Microcontroller/chip – H/W component to provide connectivity control from server to IoT appliance. F/W (Firmware) – program/soft placed on the microcontroller processor. Server – processor/computer, managing data traffic between IoT appliance and mobile application. Cloud – virtual server – servers physically placed in multiple locations and program/SW running on most optimal between them. Mobile app – application running on mobile device. 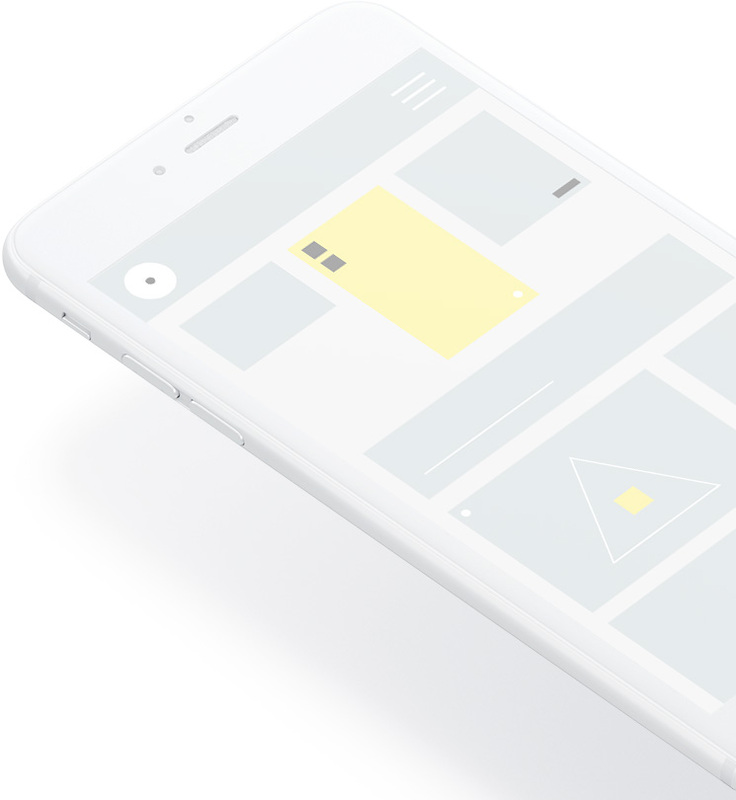 UI (user interface) – appearance of mobile app. UX (user experience) – process of enhancing user satisfaction by improving the usability, accessibility, and pleasure provided in the interaction between the user and IoT product. Cool stuff to entertain end-user and/or his friends/guests. Should be simple for the first usage, especially “killing scenario”. No gateway required for “killing scenario”, means should be Wi-Fi or BT (preferably no BLE, that requires last 1-2 years phones models only). 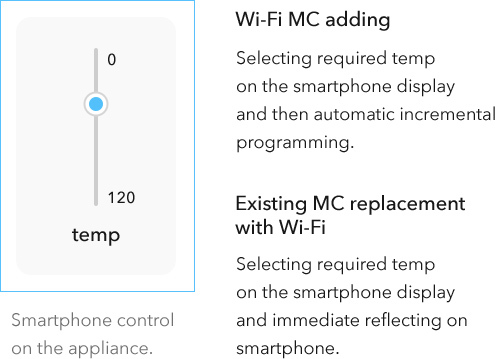 Many appliances have complex features and are problematic for configuration with limited count of buttons and small display – smartphone application is perfect to provide simple interface for configuration and full usage of all features. BT is perfect – simple connecting. Examples: recipes for cooking appliances, control over air conditioner. Cheap gateway and suitable notifications on the phone are critical. Automatic re-connecting, storing of configuration and storing last notifications until successful transferring to end user in the case of network or power malfunction is important. Examples: security detectors. Real time status of appliance should be displayed before any command. Multiple users suitable control. Option to manage users rights for status monitoring and control from “main” user and option to overwrite/block others commands. Examples: heater, water boiler. Options for notifications (should be configurable for availability when mobile app is closed and when phone is not active). Options for configurations for automatic functioning. Domain name is hardcoded in the microcontroller inside the appliance. Domain name should belong to business customer or changed to one, that belongs to business customer. Preferably to have option to change domain name by update of F/W. Preferably to have two domains hardcoded – main and secondary (that is automatically activated in the case of main domain failure). Most of products are based on “private” protocols, means they can work together with the same protocol products only. There are some alliances sharing the same protocol standard and thus allows products from the different producers to share the same gateway and work together. Proper usage of built-in to standard protocols security features makes the system pretty safe from hackers attacks. Password protected system allows access from any mobile device to anyone, who knows username and password of the account. Paired phone protected system allows access only from the phone, that was paired (process of connecting, requires physical presence of the phone near IoT appliance) to appliance. Prototype is the best way to get sense of the IoT product features without its full development and manufacturing. Cost and time of prototype can be reduced by removing features and by using approach, not appropriated to mass production. Mass production process involves in most cases many tuning and adjustments steps, that makes the product stable and reliable for the functionality and result. 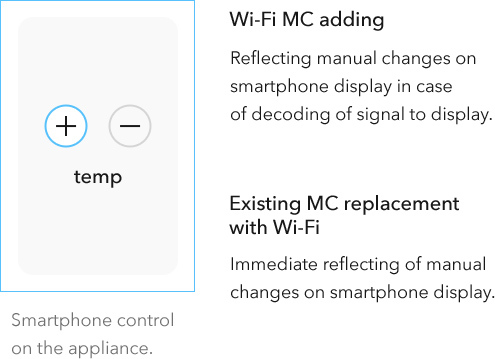 Since integrating Wi-fi or Bluetooth function requires change of microcontroller, keeping all elaborated adjustments has to be validated. Most of modern kitchen appliances have built-in PCB with some microcontroller, that gets input signals from manual control buttons, (in some cases) from sensors and controls output signals to executing elements (as heating elements) and displays. Connection to Wi-Fi in most cases is done through microcontroller with built-in Wi-Fi module. Replacement of existing microcontroller by Wi-Fi one is the most optimal from cost and PCB size points of view. The complications are around moving original algorithms to new microcontroller – in many cases owner of F/W is not ready or not able to provide source code for that algorithms. In such case reverse engineering should be applied – we have rich experience in many kitchen appliances categories and many of ours algorithms are used by manufactures. Together with experience in reverse engineering it allows us successfully convert appliances to “smart” once. Adding Wi-Fi microcontroller allows to avoid any changes in original microcontroller and the way, appliance works with manual control. 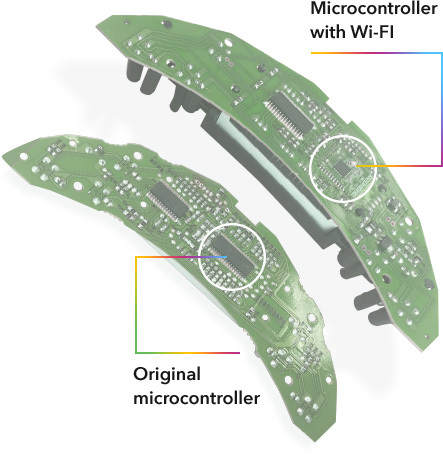 In cases where buttons and sensors are connected to main PCB through standard connectors, any change of PCB can be avoided. Reflecting manual control changes on smartphone interface. If status of some parameters is not definite before change and is done by incremental method, the current value of the parameter can be detected by monitoring output to display only. In some cases such method is very expensive. Optimal solution depends on the specific appliance. Above aspects resulting in very high amount of corner cases for testing. The most practical one is “crowd testing”, that can be done by “alpha/beta” users or by paid testers. To monitor quality of crowd testing, automatic monitoring system should be installed on all phones/appliances to collect statistics over failures over actions and users. Another very powerful testing method is “random testing” – machine randomly applies different actions and monitoring proper functioning of the system. Quality parameter of such method is level of coverage of the formal specification of the system. Simple feedback form through mobile app is important to let end-users express issues and comments and get early indications on any problems. Above features require placing relevant sensors in IoT appliance and communication channel for collecting measurements from IoT appliance.